The UNG Libraries’ Interlibrary Loan (ILL) Department supports the research and educational needs of current UNG students, faculty, and staff by providing access to materials not held in the UNG Libraries’ collections. The ILL department obtains loans or reproductions of materials needed for student, faculty, and staff research from other libraries. The ILL department conducts all transactions in accordance with U.S. Copyright regulations and guidelines as well as National Interlibrary Loan Codes. Monday-Thursday 9 a.m. - 5 p.m.
Friday 9 a.m. - 2 p.m.
Current UNG faculty and staff as well as UNG students enrolled in the current semester are eligible to submit ILL requests. ILL is not available for UNG Libraries’ community patrons. Materials obtained through ILL are for the exclusive use of the individual submitting the request. Borrowers are responsible for keeping the accompanying paperwork and/or book band with a borrowed item. Borrowers are responsible for ILL materials from the time the materials are picked up until they are returned to the Information Desk. Any charge resulting from damage to or loss of ILL materials is the responsibility of the borrower. Materials borrowed through Interlibrary Loan are the property of the Lending Library. The Lending Library maintains sole discretion in determining whether to lend material, in setting due dates, and in establishing use restrictions (no renewals/“Library Use Only”, etc.). The time needed to fulfill an ILL request depends upon a variety of factors and can vary widely. The UNG Libraries’ ILL Department cannot guarantee how quickly you may receive the materials you request, as it is sometimes a challenge to find an institution able and/or willing to lend a specific item. In most cases, books typically arrive at your UNG home campus library within two weeks, but may take as long as six weeks. Articles are usually delivered electronically, often within hours, but may take as long as two weeks. Every effort will be made to obtain items that are requested but occasionally, requests cannot be fulfilled (see Delays and Cancellations). Before placing an ILL request, borrowers should search the UNG Libraries’ collections. Go to GIL-FIND@UNG to search for books. If you don’t find what you are looking for, try GIL Express for books from other University System of Georgia (USG) libraries. For further instructions, please visit GIL-Express. Use the Find Journals A-Z tool to search for full-text periodicals. If you confirm that the UNG Libraries do not provide access to the item you need, eligible borrowers may submit an ILL Request. If you need help searching for materials, you may contact the UNG Libraries for reference assistance via email at askus@ung.edu, by phone, or in person (see Ask a Librarian for more information). The ILL Department uses an online system called ILLiad to process ILL requests. The ILL Department does not limit the number of requests an individual borrower may submit per day; however, depending on the overall volume of requests, ILL personnel may need to limit the number of requests from one user that are processed per day. 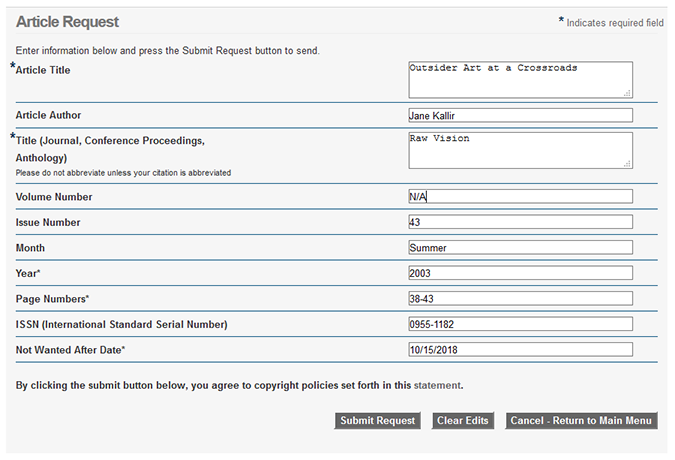 Log onto your ILLiad account (https://ung.illiad.oclc.org/illiad/logon.html) to complete and submit an ILL Request Form. Your ILLiad account login and password is the same as your UNG network login and password. The first time you login to your ILLiad account, you will need to add your contact information, including your email address. Citations should contain all available publication information. Please provide ISBN, ISSN, or other identification numbers if available. Please avoid abbreviations. Please include a “Not Wanted After Date” on the ILL Request Form. Use the Book Request Form. Include author(s), complete title, edition, publisher, place, and publication date. Provide ISBN when available. Please note if you are willing to accept any edition available. Rubin, Susan Goldman. 2004. Art against the Odds: From Slave Quilts to Prison Paintings. New York: Crown. Use the Article Request Form. Include the page numbers or chapter number. Provide the ISBN when available. Use the Article Request Form for journal and magazine articles, conference proceedings/papers, technical reports, and newspaper articles. Include author(s), complete article and publication titles, volume/issue numbers, publisher, city and state of publication, publication date, and ISSN if known. User email addresses must be accurate in order to receive electronic article delivery of the document. Email addresses can be updated or changed under “Change User Information” in your ILLiad account. Kallir, Jane. “Outsider Art at a Crossroads.” Raw Vision no.43 (Summer 2003): 38-43. The citation is incomplete, contains abbreviations, or contains incorrect information. Lending libraries are unwilling to supply the material. The material is new or not yet published. The material is in high demand. The item is a textbook. The material is rare or unique, such as an archival item or a dissertation with no circulating copy. The material is published in or primarily held in foreign countries. The request does not comply with copyright law or guidelines. You will receive notification via email that your item is available for check out from your primary campus library. Your Nighthawks Card or government issued photo ID is required for check out. Please note the item’s due date and any restrictions for use. Microfilm and microfiche typically may not leave the library. In most cases you will receive an email notification that your item can be viewed online in your ILLiad account. In some cases, licensing restrictions may require you to pick up a physical copy of an article. If so, you will receive an email stating that your photocopied item may be checked out at your library’s Information Desk. The Lending Library determines the date ILL materials must be returned. ILL materials should be returned to a UNG Libraries’ Information Desk on or before the due date noted on the book band attached to the front of the material. Scanned items accessible via ILLiad may only be available for a limited period of time. The Lending Library determines whether their materials may be renewed. If allowed, typically only one renewal is permitted. Apply for renewals within 5 days of the due date using the ILLiad system. ILLiad does not allow renewals outside of the 5-day period, renewals of overdue materials, or second renewal requests. All loans are subject to recall by the Lending Library and must be returned immediately if recalled. All materials must be returned directly to any UNG Libraries Information Desk. Please do not place ILL materials in an outdoor book drop. Intercampus Courier allows you access to materials across all of UNG's libraries without having to travel to another campus. If the UNG Libraries own a book or DVD you need, you can have the item sent to your home campus. What is Not Available Through Intercampus Courier? Reference books, rare books, items in the UNG Special Collections and Archives, some DVDS, technology, and other items that do not circulate cannot be requested. Watch the video Getting Books from Other Libraries with GIL-Express for a demonstration. Requests may be placed only on items that are currently unavailable, or that are located on another UNG campus. Patrons can select the UNG campus to which they want the requested item(s) to be delivered. You will receive an email when the item arrives at your home campus, usually within two to three business days. The courier service does not operate over weekends, official holidays, on Fridays during summer sessions, and when the university is closed. GIL Express is the fastest way to get a book from another school and is preferred over Interlibrary Loan. How Does GIL Express Work? If you need a book that the UNG libraries doesn't own, change the drop-box in GIL-Find from "University of North Georgia" to "University System of Georgia." This searches all the libraries in the University System of Georgia. If another USG school owns the book in print format, you can have the book sent to your home campus at UNG through the GIL Express service. You can also borrow and return books directly to any University System of Georgia school if that is more convenient. What is Not Available Through GIL Express? DVDs, e-books, and reference books are generally not available through GIL Express. Video: Getting a Book from Another Library with GIL-Express. You’ll get an email when the book has arrived at the UNG Libraries. GIL Express books usually check out for 28 days. There are currently no overdue fines but some libraries charge overdue recall fines. You can often, but not always, renew up to two times. Renewals are not guaranteed and may be blocked if you have overdue items and/or fines or if another patron requests the item. To initiate a renewal request, you must sign in and then go to My Account. The GIL Express courier service does not operate over weekends, official holidays, and when the university is closed. More information is available through the University System of Georgia’s GIL Express site. Am I eligible to use the UNG Libraries’ Interlibrary Loan service? UNG students enrolled in current semester classes as well as current UNG faculty and staff may use the ILL service. The ILL department primarily obtains books, book chapters, and journal articles, except textbooks. How do I submit an ILL request? First, check to see if the material you need is available in the UNG Libraries’ collections (see "Before Submitting a Request" in the Borrowing section). If UNG does not provide access to the material needed, login to your ILLiad account and complete the appropriate request form (see "Submitting a Request" in the Borrowing section). How long will it take to get my materials? Turnaround time depends on the availability of the item and the Lending Library’s practices. Books typically arrive at your UNG home campus library within two weeks, but may take as long as six weeks. Articles are usually delivered electronically, often within hours, but may take as long as two weeks. The arrival date of ILL material cannot be guaranteed, so please plan well in advance. Why was my request delayed/canceled? Where do I pick up my ILL and how will I know it is ready? E-mail notifications inform borrowers of the arrival of requested materials or if there are any issues regarding a request. Books and other physical items may be picked up at the Information Desk of the borrower’s campus library; articles typically will be uploaded into the user’s ILLiad account. Go to your ILLiad account, select Change User Information, and update your email address. Can ILL materials be renewed? Some Interlibrary Loan materials may be renewed once, at the Lending Library’s discretion, but the request must be submitted before the original due date (see Renewing section). Login to your ILLiad account. The View My Requests section allows you to select a transaction for renewal. Where can I return ILL materials? Interlibrary Loan materials may be returned to the Information Desk at any UNG campus library. They should not be placed in the book drop. What if I have damaged or lost my ILL item? Interlibrary Loan materials are the property of the Lending Library. In the event an item is lost or damaged, the Lending Library may charge the borrower fines and/or fees. When items are lost or damaged, the borrower will be responsible for the fines and/or replacement costs of the material. Please email the Interlibrary Loan department at ill@ung.edu for assistance with an ILL request. If you need help searching for materials, you may contact the UNG Libraries for reference assistance via email at askus@ung.edu, by phone, or in person (see Ask a Librarian for more information).